Getting your software to do what you want it to shouldn’t be as difficult as climbing the Burj Khalifa. 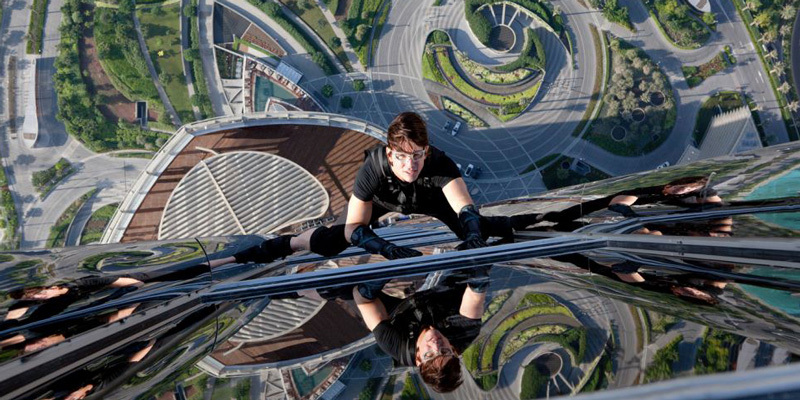 Luckily for you, Setmore is super flexible and lets you channel your inner Ethan Hunt to customize a solution for virtually any problem, no Ghost Protocol required (that’s the last one, we promise). We love it when innovative people use Setmore beyond the scope of what we’d originally dreamed. So after taking in your feedback and paying attention to all the wonderful ways in which you improvise using Setmore, we’ve put together this collection of hacks in the hopes that other readers can learn, duplicate, and succeed. How to: create a public-facing calendar that shows your availability; link your Booking Page in different languages; and more. How to: use Setmore for multiple locations; cap the number of appointments available in a day; and more. 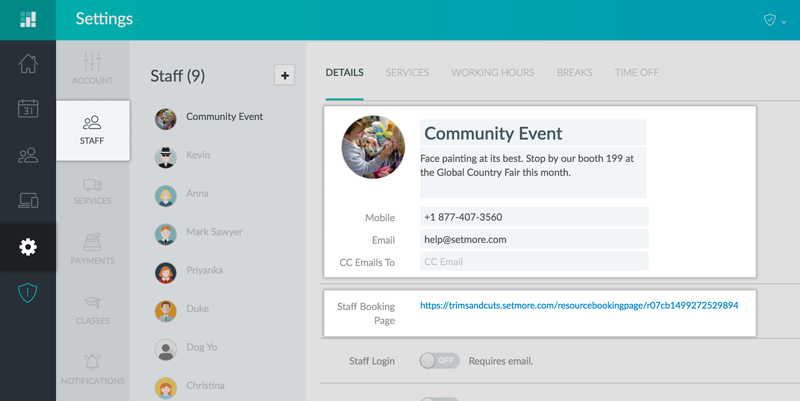 Setmore already lets you embed your Booking Page on your website. But if you want to limit the available services and date/times to a specific staff member’s availability, you can do that too. Step 1 – Go to Settings > Staff and pick a staff member profile. At the bottom of the staff member profile, find the area for Staff Booking Page URL and copy the web address found there. Save and publish your changes to the webpage where you want the staff member’s Booking Page to appear. Step 3 – The staff member’s Booking Page will appear on your website. This will allow customers to only book appointments and times with this staff member – they won’t have access to other staff member profiles in your Setmore account. This is super useful if you want to give each staff member a customizable page on your website, while still giving customers direct access to book an appointment. 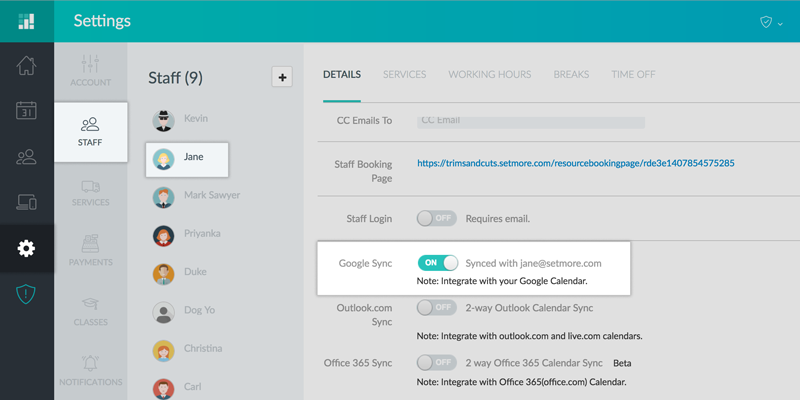 It also allows you to do nifty things with staff calendars, such as using them for one-time events, or segmenting your services based on a separate location or separate hours. If you have a special promotional event that will be run on a one-time-only basis, you can use this trick to let customers book their attendance at the event or at certain times within the event timeframe. This could be for a pop-up stand, a free account setup, or something as simple as a face-painting booth (just as an example). Step 1 – Create a new staff for the event, give it the name of the event. This name will appear at the top of the Booking Page once deployed. Copy the Staff Booking Page URL from this profile. 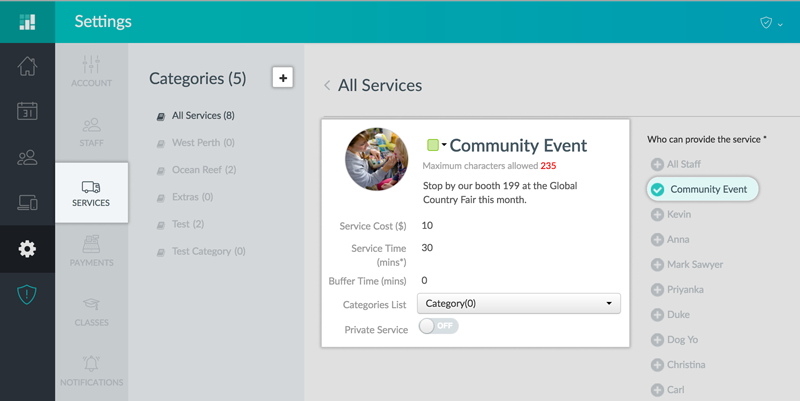 Step 2 – Create a new service for the event, and assign only the event service to the staff profile created in step 1. Give it a thumbnail image, a duration, and a cost if applicable. Step 3 – Create a separate webpage for the event on your website, and follow the directions in Hack #1 to deploy the staff Booking Page here. This will limit customers’ access to only the event Booking Page. The key benefit here is that it will link to your existing Setmore account, so you can manage everything all in one place. And if you have Setmore Premium, then you’ll also get the benefit of any email or text reminders that are automatically set for each appointment. Step 2 – In the My Details window, click the “Change My Password” link. Step 3 – Leave the field under Old Password blank. Enter your new password twice where prompted and click “Save Changes” when everything looks good. Your password is now updated and you can start using your email address and password to log in. You’ll need a legit username and password if you want to integrate Setmore with some of our supported productivity apps, like Zapier, which require you to sign in with a Setmore account through Zapier (but they don’t let you do it with Facebook or Google). Whether two or more staff members share a single workspace, a single piece of equipment, or maybe a single set of tools – if only one customer can be serviced at a time, then you’ll need some way to block out availability across multiple staff calendars once a timeslot is booked. 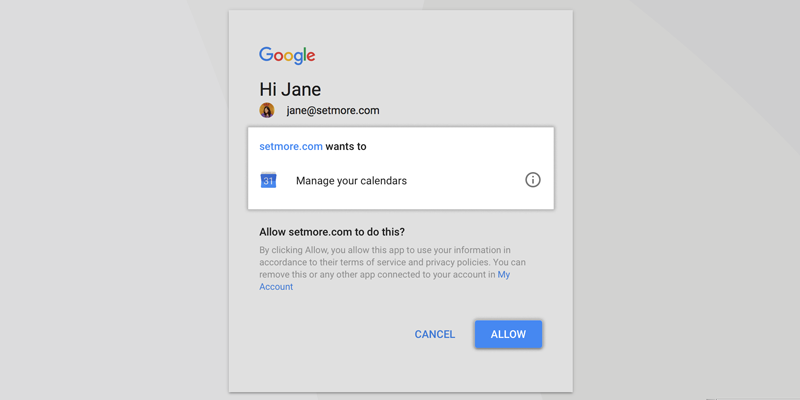 Setmore Premium users can accomplish this using the Google 2-way sync and a shared Gmail account. Step 1 – Go to Settings > Staff and choose a staff profile. Step 2 – Activate the switch for Google Sync, and you’ll be prompted to sign in with your Gmail username and password. Step 3 – Repeat this process for any number of staff members by activating the two-way sync with the same Google account. Now when an appointment gets booked for one staff member, the Google 2-way sync will duplicate the same appointment across other synced staff calendars as well, blocking out their availability and preventing customers from double-booking the same room or equipment. Our main goal in building Setmore was to make an appointment scheduling and management platform that’s uncomplicated, simple, and organized. But with a little bit of cleverness, Setmore can help you accomplish more than what we intended. Our work continues, but if our platform helps turn business owners into innovators and problem solvers, then that’s even better. Is there a hack that we haven’t covered yet and it works well for you? Post a comment below and share your knowledge! I’d like to limit the amount of bookings any individual can book. I have multiple clients with different amount of sessions available to them and do not want them booking over what they paid for. Beyond that, we don’t as of yet have a way to limit bookings per customer. Hi Karin, you can add text to the footer of your email notifications by going to Settings > Notifications > Customization. Please see “Customizing the email sender name and signature field” in the support article here for more info: https://support.setmore.com/reminders-and-notifications/customer-email-alerts. If I recall correctly, I don’t believe there’s a character limit to the signature field, so it should accommodate your 400 chars rather handily. Can this software be used to manage volunteers? If so, how? Hi Donna, you sure can, although it depends on how you want to coordinate your volunteers. One method is to use the Booking Page as a sign-up/intake form for your volunteers to claim certain shifts. To do this, create a class for “Volunteer Shift” and designate the duration and number of “seats,” which will be the number of volunteers you want on shift that day. Next, share your Booking Page URL with volunteers and get them to sign up for the class (“volunteer shift”) session. Each session attendee will get an email confirmation and reminder, too. We’ll probably cover this in greater detail in the next Hacks post. Let me know if you have questions! Is there a way to set up a name your price feature for clients? I’d like to be able to do this in both my business and community pages. I am starting a Facebook community for massage therapists in my area that will allow for prospective clients to place a price bid that a massage therapist can then negotiate a unit of time for. This community will act as an incubation site to help new incoming therapists and those who are having trouble marketing themselves. Example: client has $15 to spare, places bid, and identifies major cross streets they are located at. A therapist determines that the distance and amount is worth so much minute units and then confirms booking. Is there a way to only show predetermined available time for booking. For example, we have a contractor that shows up this month on the 30th from 3pm-8pm. How can I show that on the web/calendar so clients can book him on that date between those times? This is not a recurring appointment or “shop hours”. Next month he might have two dates with set hours available as well. Thanks. Hi Robert, on your Booking Page, the customer will select the service first, then staff, then date/time. Availability for a service is linked to the staff member’s working hours. So the first thing you’ll want to do is adjust the contractor’s working hours in their staff profile, under Settings > Staff. Hi Leanne, thank for you commenting. Support for multiple rooms/locations is on our product backlog. Our development team hasn’t prioritized this feature, but if anything changes I’ll let you know. Thanks again! 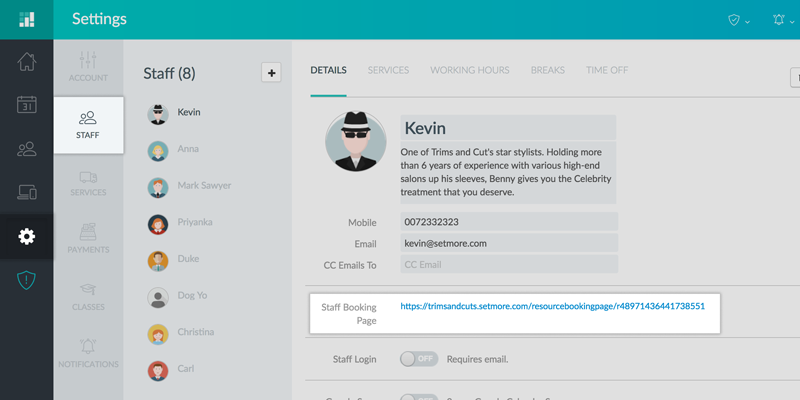 Hack #1: Embed a staff Booking Page on your website. Did not work. I tested it with Wix, WP, and Godaddy. I was wondering how to open a single day for booking, normally I do not work Mondays, but wanted to open one Monday. Hi Sarah, right now we don’t have a feature that allows for single-day availability. The best I can offer is this workaround: you can open all Mondays and then block out all but one using the Time Off feature (https://support.setmore.com/staff/staff-working-hours-breaks-and-time-off). Others have requested this feature and it’s on our product backlog, but I don’t think the development team will prioritize it anytime soon due to other projects on their plate. Hope that helps! Let me know if there’s anything else I can do, thanks for posting. Hi! If the only staff member wants to provide services in two neighboring cities, what would be the recommended way to set this up. If someone wants to book an appointment in city #2, it takes 30 minutes to drive there and back, and this causes a problem with available slots in city #1 both before and after the appointment. Of course, you can define a 30min buffer time for appointments, but then if there are two back-to-back appointments in the same city, the buffer time is unnecessary. Is it possible to set up a way to only allow a user to book an appointment and then once that spot is booked to block it out from other users being able to book? I want to limit their access. Also is it possible to add a +/- button to sell say 2 of the same item during an appointment? Hi Zack, yes once customers book a time slot, that time slot should be occupied and no other customers will be able to book it. Only you as the account admin can double-book a slot. As for your second question, you can allow customers to book “Add-on” services after they select their initial service. This is called “Provide Multiple Services” and you can enable it in your account under Apps & Integrations > Your Booking Page (Configure) > Booking Policies > Provide Multiple Services. This article will walk you through how to set it up and what to expect: https://support.setmore.com/services/booking-multiple-services. It’s important to note that when customers book multiple services, they show up as individual appointments that are back-to-back on your calendar. 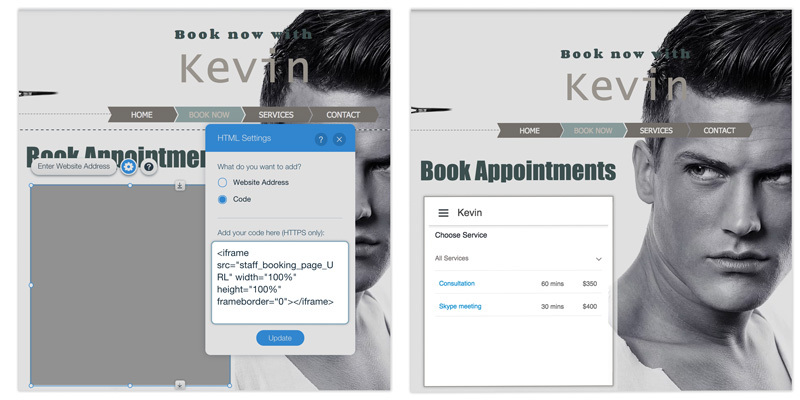 Setmore won’t automatically lump all the services into a single appointment for you. That’s just a limitation of our platform currently. I hope that helps!